An 18-year-old Archer Heights woman told police she was robbed on the front porch of her home, near 49th and Kedvale. She reported that at about 12:30 p.m. Friday, June 13, she heard her front doorbell ring, but she did not see anyone on the porch. When she walked outside to investigate, she was pushed down by a robber, who stole her cell phone and ran away east on 49th Street. The robber is described as a white Hispanic man, 24-28 years old, 5’9 to 6’0 tall, olive complexion. A 48-year-old Sleepy Hollow man told police that his car was stolen at gunpoint from his garage, near 46th and Kilpatrick, at 5:25 p.m. Sunday, June 8. He said he was standing near his garage when two men approached. One asked for a beer and the other pulled a pistol and demanded his car keys. They sped away in his 2005 Chrysler and are described as white Hispanic men age 25-35, 5’7 to 5’11 and 175-190 pounds. Avenue) and want to stand shoulder to shoulder with your neighbors against crime and for community improvement, come to the next meeting of the Garfield Ridge Neighborhood Watch, set for 7:00 p.m. Monday, June 16 at Gloria Dei Lutheran School, 5259 South Major. One of Chicago's most active and effective citizen-led crime fighting groups. Important: This month's guest speaker is from the Illinois Department of Transportation, who will offer an update on the Central Avenue at the Belt Railway of Chicago (BRC) Railroad Grade Separation Study (54th and Central). A 30-year-old West Lawn woman told police she was robbed of her purse and cell phone at 1:30 a.m. Tuesday, June 10. She said she noticed her car was followed very closely by another vehicle as she drove west on the 3900 block of West 59th Place. Fearing for her safety, she stopped in the middle of the street, in front of 3947 W. 59th Place, and fled on foot toward Pulaski, where she flagged down another person, who called 911. She said she looked back and saw two men rummaging through her car, but had no useful description of them. A photo posted publicly in a Garfield Ridge Facebook group. 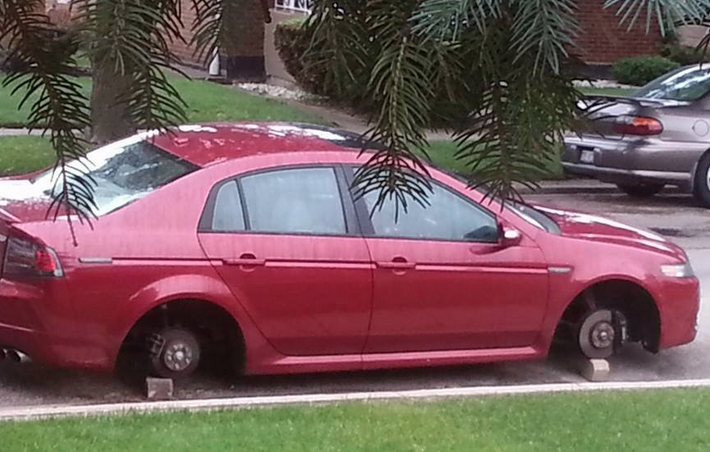 Thieves stole all four tires and wheels from two cars in the early morning hours of Thursday, June 12. One car, a 2008 Acura, was parked in front of a home near 51st and Natchez. The other, a 2006 Lexus, was parked in front of a home near 51st and Latrobe. Both cars were left sitting on bricks. Police did not speculate on whether the crimes were committed by the same criminals. Want to work directly with Chicago Police to prevent crime in your neighborhood? If you live in Beat 811 (see map), come to Good Shepherd Presbyterian Church at 7:00 p.m. Tuesday, June 17. Hear updates on crime in your neighborhood and learn how you can work with neighbors and police to make the community safer and better for all. Burglars entered the back door of a barbershop at 3907 W. 47th St. and stole a wide range of hair care appliances, tools and products, a barber chair, four TVs, and a video game console and video games. The crime was discovered by a shop employee, a Brighton Park man, at 11:15 a.m. Tuesday, June 10. He notified police, as well as the shop’s owner, a 37-year-old Vittum Park man. The police report noted that the shop’s back door was unlocked. Burglars entered the unlocked service door of a garage near 51st and Laporte and stole a lawnmower and a stereo speaker. The crime was discovered by the victim, a 46-year-old woman, at 12:55 p.m. Friday, June 13. Neighbors later told police they had seen two white men walking down the alley, pushing a lawnmower. Burglars kicked in the front door of a home near 53rd and Millard and ransacked the premises. The crime was discovered by the victim, a 42-year-old woman, at 7:45 p.m. Friday, June 13. She was initially unable to determine what, if anything, had been stolen, police said. Burglars entered a garage near 59th and Kildare and stole an assortment of power tools, as well as a car jack and an air compressor. The crime was discovered by the victim, a 46-year-old man, at 5 p.m. Thursday, June 12. Burglars entered a garage near 60th and Mulligan and stole a power washer and a tile saw. The crime was discovered by the victim, a 58-year-old man, at 9 a.m. Tuesday, June 10. The victim told police that the burglar broke into his car, which was parked outside, and then used the automatic garage door opener to gain access to the garage. Burglars forced open the back door of a home near 67th and Kedvale and stole a laptop computer and about $10,000 worth of jewelry. The crime was discovered by a neighbor who called 911 to alert police. The victim, a 35-year-old woman, was located and came home to assess damage.